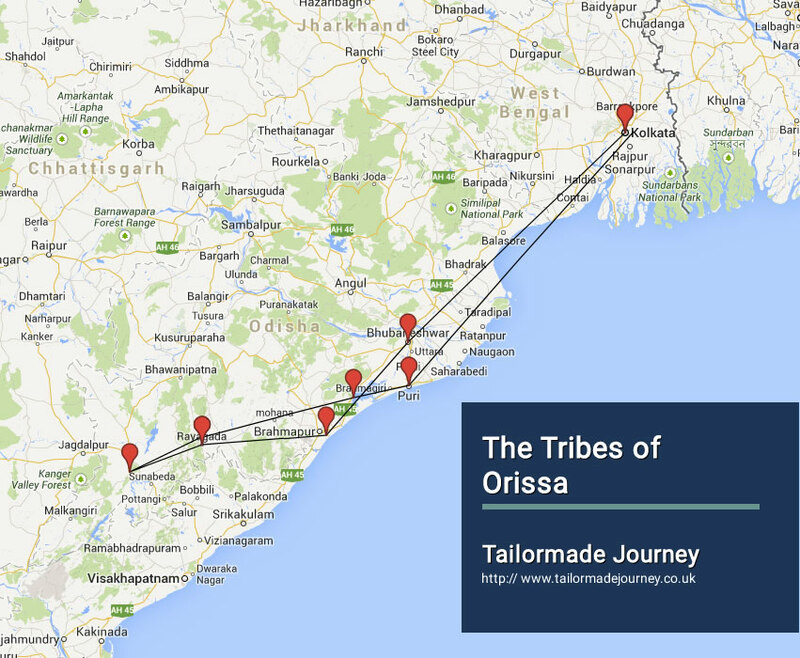 Explore the North – Eastern Indian State of Orissa. This tour helps one to discover the lifestyle of Tribal Peoples of Orissa. Arrive Kolkata 1 Night > Day Train Bhubaneshwar 2 Nights ( Lingaraja Temple ) > Drive Gopalpur 1 Night > Drive Rayaguda 1 Night > Drive Jeypore 2 Nights ( Bonda Tribes ) > Drive Rayaguda 1 Night > Drive Barkul 1 Night ( Chilika Lake ) > Drive Puri 2 Nights ( Lord Jagannath Temple ) > Drive & Flight Kolkata 1 Night & Leave. Upon arrival in Kolkata International Airport you are met by our Executive and transferred to your pre booked Hotel. Afternoon city tour of Kolkata visiting to the Fort William – a fort built on the Eastern banks of theRiver Hooghly by the Britishers and named after King William III of England, St Paul’s Cathedral, Birla Planetarium and the Botanical gardens. Today you are transferred to Kolkata Railway Station to board Train for Bhubaneshwar. Upon arrival in Bhubaneshwar Railway Station you are met by our Representative and transferred to your pre booked Hotel. After breakfast proceed for city tour of Bhubaneshwar visiting Khandagiri & Udayagiri – the twin hills famous for the finely carved caves. Later visit to the Lingaraja Temple – the true mixture of dream and reality with elaborate carvings, sculptures and architecture, Dhauli Giri – the Ashoka’s Peace Pagoda or the Shanti Stupa, Rajarani Temple – a temple made up of red – gold sand stone, and Mukteshwara Temple. Overnight stay at the Hotel in Bhubaneshwar. After breakfast leave by Private Vehicle for Gopalpur. Upon arrival in Gopalpur check in at your pre booked Hotel. Gopalpur is amongst the popular beaches in Orissa. Gopalpur-on-Sea is a beautiful and small beach resort located along the Bay of Bengal in the eastern Indian state of Orissa. After breakfast leave by Private Vehicle for Rayaguda. Upon arrival in Rayaguda check in at your pre booked Hotel. A Tour to Rayagada, Orissa offers perfect opportunities to visit nearby places of interest like Devagiri, Hatipathar, Padampur and Minajhola. After breakfast leave by Private Vehicle for Jeypore. Enroute visiting Chatikona to witness the Interesting & colourful weekly market of the Dongaria Kondh Tribes, these are interesting ornamental Tribes coming down from their mountain known as Niayamgiri hill range. Upon arrival in Jeypore check in at your pre booked Hotel. Overnight stay at the Hotel in Jeypore. After early breakfast proceed to Ankadeli to witness the most primitive, interesting & unique tribal weekly market of the Bonda tribes. The place is the border to the neighbour state Andhra Pradesh, divided by river Machkund, with interest waterfall, mountain & forest, as soon we will arrive near the market, and you will be taken inside for about 2/3 km walk to witness the Bonda man & woman coming down from the forest side. Bonda are the most primitive tribe of India. Bonda women wear silver & brass rings around the neck and necklaces on the body. The woman’s have shaved head and wear small cloth to cover the private area. The men carry bow & arrow and country made liquor. Afternoon proceed to explore another primitive tribal community the Gadaba, here you can watch the most colourful tribal dance call Demsa (if everything is OK in the village). Late afternoon drive down to Jeypore. After breakfast leave by Private Vehicle for Rayaguda. Enroute visiting the Jagannath Temple and the Tribal Museum at Koraput. Upon arrival in Rayaguda check in at your pre booked Hotel. After breakfast leave by Private Vehicle for Barkul on Chilika Lake, the largest brackish water lake in Asia. Upon arrival in Barkul check in at your pre booked Hotel. Overnight stay at the Hotel in Barkul. Morning go for boat ride in the Chilika Lake.Later leave by Private Vehicle for Puri, also known as Jagannath Puri. It is one of the oldest cities situated on the coast of Bay of Bengal. And a popular beach resort from where both Sunrise and Sunset can be viewed from the beach. Enroute visit to Raghurajpur or Nayakpatna village of artisans or craft’s village. Upon arrival in Puri check in at your pre booked Hotel. Overnight stay at the Hotel in Puri. Today you leave by Private Vehicle for Bhubaneshwar. Upon arrival in Bhubaneshwar you are transferred to Bhubaneshwar Airport to board flight for Kolkata. Upon arrival in Kolkata Airport you are met by our Representative and transferred to your pre booked Hotel.